The tragic fifteen month saga of Treo 700p appears to have finally reached its conclusion with the re-release of the fixed version of the 700p 1.10 ROM updater for Verizon Wireless. Following in the footsteps of the release of the revised 700w/wx ROM update on the 18th, this update adds no new features but is intended to resolve the 700p’s much-maligned network disconnection issues. The Verizon-specific versions of the Treo 700p maintenance release was originally made available on July 12th but only remained live for one month. The 700p updater was pulled alongside the Treo 700w/wx versions in August due to the infamous “Error 3000 bug” being present on both user-updated and factory-flashed Treos bearing the new firmware. Improved handling of SMS messages to lessen stalling of messages. The update is designed for both Verizon ROM versions of the 700p, including the initial 1.06 ROM. 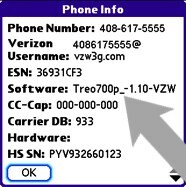 The earlier flawed version of the 1.10 ROM is indicated by “TREO700WX-1.10-VZW” as the software version in the Treo phone app’s “Phone Info” screen. Palm’s 700p MR download page offers a helpful guide is given listing the approximate amounts of time required to complete the update. Install times are estimated to be 35 or 10 minutes. The updater is compatible with all recent versions of Microsoft Windows and Mac OS X. Windows Vista users will need to install this update via a blank SD card, while Windows 2000 and XP users can HotSync a self-executing update file to their Treos. Palm does give one note of caution to Windows Vista users running the latest Versamail 3.5.4 to sync with a Microsoft Exchange Server. These users are instructed to not install the 700p update to a bug where calendar items will not be properly synchronized. Palm currently offers no workaround for this issue other than the recommend to sync with an older PC running Windows 2000 or XP. Palm currently does not have a Vista-compatible version of the Versamail installer at this time. Look for a full PIC report soon on whether or not this re-released 1.10 update successfully resolves the remaining issues with the Verizon 700p. ...Verizon can now drop the EOL 700p and introduce the 755p (or whatever the number is)? Did a hard reset on my 700p after backing everything up. I run Vista, so I ran the update from an old SD card I had in my desk drawer. I was running a VZW-flashed 1.10 ROM on my current Treo (a VZW refurb) that replaced my old 1.06 700p when the digitizer went south on me. The ROM update process took about 8 minutes, give or take. I am getting an "Install EASLib Library" error message every time I reboot, oddly enough, but I can live with that. Maybe I need to reinstall VersaMail 3.5.4? Both before and after restoring all of my data, my 700p seems to be a *TAD* snappier when going from app to app so maybe they did something to further address the lag? It also seems a *TAD* quicker to connect to the network. No "Error 3000s" here yet! So far, intitial impressions are very positive indeed. It took long enough for sure, but this definitely the best my 700p has "felt" since I got it in June '06 and it's finally operating in the manner it should have upon release. RE: Initial install a success! The quickness is due to the hard reset, not reapplying the patch. Hmmmm. I did the early upgrade, with no "Error 3000"s, but with sucky lag time and BT Connection - worse than before, especially opening Blazer (a good 12-15 seconds). Any thoughts that the "new" release will address those issues better than the 1st? I hesitate to upgrade again just for the hellovit unless those issues are resolved now. Just an FYI. As far as the Blazer startup lag is concerned. After doing the following, my 680 went from 15 seconds down to about 1 second. Go into FileZ (the free file mgr that Palm should license yesterday) and delete all files related to Blazer. You can tell by the filename what you may wanna preserve. Fear not, the .PRC is in ROM. For safety, just copy files over to your SD and then delete em' after testing. Snappy as the Calendar app for me now. Apparently Blazer has to slowly digest all that overhead before getting started. Actually makes the web usable again. Well, VersaMail was still acting funny so I went ahead and did a hard reset and wiped out all of the various VersaMail and MM* ("MultiMail") files on my Treo then reinstalled VM 3.5.4. After HEAVY use over the weekend and taking a big roadtrip on Sunday to see some relatives, I can safely say that my 700p's been doing better than it's ever been. The latency seems reduced so while my actual throughout is not improved, it seems spappier to respond to clicking on URLs etc. The Treo connects to the Verizon network faster and doesn't appear to "bleep bloop" freeze up when in a marginal signal quality area. Bluetooth is the same as it was before. Not perfect like my Motorola dumbphone but still worlds better than 1.06 on the 700p. Overall system lag still appears to be a touch better now than it was before. Voice quality, battery life, camera quality and everything else is unchanged. Now I think that the 700p is finally worth MAYBE an 8/10, definitely a 7.5/10. It's still a lame phone, and its multimedia capabilities along with Blazer and VM need serious improving but it's finally a solid, servicable smartphone (Official SDHC support helps matters quite a bit). Even if the 755p was available today on Verizon, I don't think the slightlly faster performance, improved FF, and soft-touch surface would be enough to make me give up a "patched" 1.10 700p just yet. SO FAR SO GOOD.....I followed the following steps several days ago when I first got the update. Thus far, the device has performed as intially expected it should when I first purchased the 700p. I may post a retraction latter on if challenges beyond reason arise. 1. Backup the device using a backup utility like Resco BackUp or Resco Explorer's Backup built in utility. Both are available for download, they are both 15 day trials but are fully functional and will do what is needed to backup and restore. I purchased Explorer and evaluating BackUp. I am pleased with both products. 2. Do a hard reset first before even inserting the SD card with the update. This will mimic the same practice as updating one of these device straight out of the Verizon box. In other words, you'll be updating a fresh device. 3. Insert the SD card and away you go. The device will reset a few times, but no worries. 4. When its done, insert your SD card that has your backup on it using your favorite utility, restore and done. This is where the backup utility is perfered over a HotSync. The backup utility mentioned above restored everything to a "T" and I mean everything. The definite recommendation from my perspective. I must say that this update thus far has been a better experience than the last update. The last update was perform properly yet the device performed poorly from the moment it was updated. It turned my Treo into a brick!! Oh wait. I don't have a Treo. it also bricked my phone. I am done with palm. It has been a nice 5 years. 600, 650, 700p but I am done. Good bye palm!